The original was in color, but I black-and-whitified this one so as not to accidentally cause readers to love global warming. It’s official. Science has donned the leather jacket, slipped on a pair of becoming Bermuda shorts, strapped on a pair of water skies, and soared into the air over the gaping jaws of carcarian carcarius. The solution is the same as it was for Fonzie and the gang. Cancel the show. The headline is not believable, but it’s true. 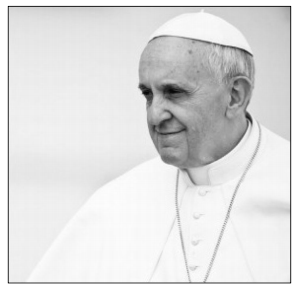 “Brief exposure to Pope Francis heightens moral beliefs about climate change”. That is the title of a peer-reviewed paper in the august journal of Science Climatic Change, by Jonathon P. Schuldt and three others. Now Schuldt does not mean actual exposure to the Holy Father himself. No, sir. That would be absurd. After all, would enhanced thinking about the forced positive-feedback of carbon-dioxide-induced warming in climate models be your first reaction upon kissing Pope Francis’s ring? Of course not. What Schuldt means is that brief exposure to a small picture of Francis causes people to become warm and fuzzy about the notion the planet is warming dangerously. Somehow, then, this headshot (which adorns the top of this post) causes different effects in Republicans and Democrats. Maybe those theories that Republicans and Democrats have different brains, or different chemistry, were right after all. And, say, does not Schuldt’s paper put you in mind of another? It should. Raise your hand if you remember “A Single Exposure to the American Flag Shifts Support Toward Republicanism up to 8 Months Later“. Exploring the role of incidental emotions in support for climate change policy”, “A rose by any other name …? : What members of the general public prefer to call ‘climate change'”. Incidentally, Yours Truly, being a bona fide climate scientist, is not a member of the general public, so it might be irrelevant in noting my preference to call the aforementioned rose global warming. I figure that since we promised global warming, we ought to deliver on global warming, and it’s best to call things by their proper names. Skip it. What Schuldt did was to gather a group of folks on line, none of whom were climate scientists, and ask them their opinion on this difficult, almost intractable subject. Because, hey, why not. Not only might we learn why our best models predict vastly more warming than we actually see, but we might even learn the length of the emperor’s nose from these non-experts. To examine Pope Francis’s influence on moral perceptions of climate change, respondents were randomly assigned to answer the above three questions either before or after a question that was designed to prime thoughts about the pope and his views on climate change… In the treatment (pope prime) condition, participants were first presented with a picture of Pope Francis and a question assessing awareness of his views on climate change (i.e., how much they had heard or read about the encyclical), before answering the three moral perception questions (Fig. 1). In contrast, those in the control condition were presented with the identical image and question after answering the moral perception questions. The two conditions were identical in all other respects. A logistic regression analysis of feelings of personal responsibility for contributing to climate change, again controlling for the aforementioned covariates, revealed a marginally significant main effect of the pope prime on feelings of causal responsibility (B = .22, OR = 1.25, p = .08). This isn’t exactly a wee p-value, but what the hell. Some of the other questions did get modeled wee p-values. And, as this book goes to great lengths to prove, everybody acts (and many believe) as if wee p-values prove cause. To exert an influence is to cause. QED. Anyway, the solution to global warming caring—and not global warming itself: what we’re after is enhancing people’s religious feelings in global warming—is to have armies of students march around and briefly expose people to pictures of Pope Francis. It appears that religious feelings toward global warms are easier to prove than global warming itself. And are just as meaningless. The real question is, does exposure to the Pope increase devotion to the faith? Has he stimulated a tide of converts? Has anyone validated the method? That is, what is the whole range of responses to brief exposure to any image? I’d like to know the response people have to a picture of leeches, or a dog doing his business on a lawn, or balloons. What about rent-a-mobs? Or toast landing butter-side-down on the floor? How about wombats? Meteor flashes? Navel lint? Books about uncertainty? Hats? Martians? Flatfish? The issue is neither difficult nor intractable. Warmer is plainly better. If the planet is warming, then that is a pragmatic and moral good. If the planet is cooling, then that is a disaster in all respects. The Holy Father has been misled or misquoted or both. Flashing his photo for purposes of pseudo-scientific perversity and intimidation is similar to, if not typical of, most of your common everyday flashers. It’s good to know that religious leaders such as Pope Francis, not just political creatures like Trump, MAY exert a significant influence public opinion. Pope Francis would probably be happy to hear about the conclusion. I sure love the pencil drawing of Dalai Lama on my office wall. It does wonders. Might I suggest that, in Protest, you print out all your posts on the Popes position on Global Warming and nail them to the door of a local Catholic Church? First off. Where did you go to on Twitter W? Secondly. Ugh UGH UGH!!! The Abstract made my ears bleed and my dog’s head started rotating 360 degrees and spewing vomit. How on earth did this junk get publi.. never mind. we know how.